NICI wallpaper (NICI hintergrundbilder) is here again! Since our previous attempt at bringing you nici wallpaper for all NICI fans. 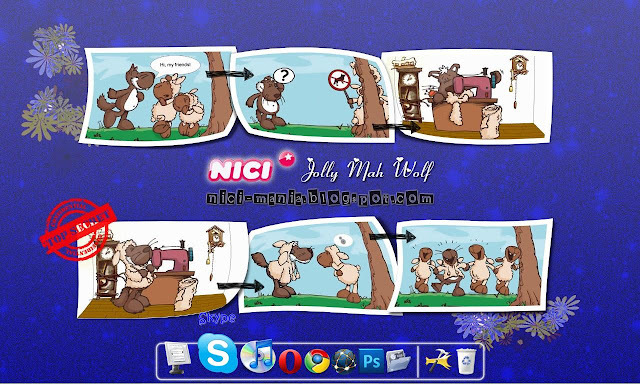 We now present to you Jolly Wolf Jolly Mah wallpaper, please follow the link to the NICI wallpaper download page to download. This wallpaper is made with screenshots from the Jolly Mah Jolly Wolf screensaver by NICI. Credit to all the NICI Germany designers for these beautiful cartoon drawings. Due to popular demand for Jolly Mah wallpaper, we decided to make this NICI wallpaper first. Please feel free to leave any comments or criticisms on what we can improve on, we'd love to know what you like or what you dislike about our NICI wallpapers. Custom made NICI wallpapers tailored to your specs can be done! Thanks for sharing those beautiful wallpapers with us! I've been using your panda's wall paper since downloaded, surprise that the bright background suits my desktop very well (i always use dark color as desktop background). Now set my desktop to this dark color Jolly Wolf wall paper, but i kind of not used to the darker desktop background anymore. LOL. Thank you Hugo, I love it!! So beatiful! !